Living in the Great Outdoors, breathing in fresh air and freedom, discovering the rhythm of life and pushing your boundaries… Camping with Kesari Tours in Manali comes highly recommended for the urban soul. Ask any person, child or adult, to sketch a landscape and most likely they will draw the sun peeking out from between two mountains, a river flowing past and a little house sitting snugly nearby. The dream location in our mind hardly ever changes… And camping gives us the opportunity to live this dream. Camping offers a break from mindless routine and exhausting schedules. It takes us to a pristine natural world where mind, body and soul are rejuvenated and refreshed. And yes, it gives us the confidence and bounce to return with greater vigour! 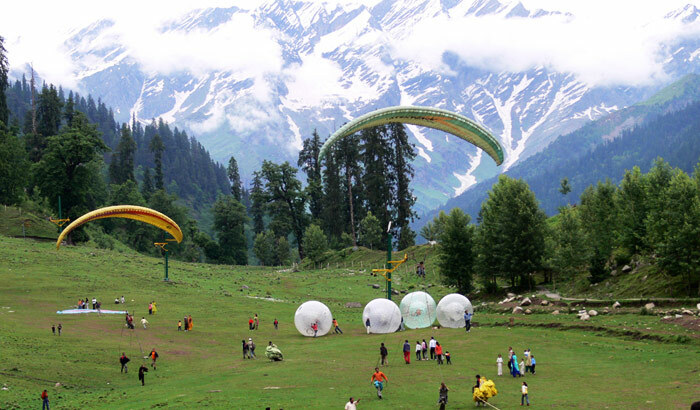 Manali, with its well-defined snow views, clear flowing river, deodar and pine forests, and adventure activities makes for an ideal camping destination for travelers of all ages. Living in the lap of nature in enchanting Solang Valley, each day is a gift of adventure and excitement. Underneath the clear blue skies, your spirits are cheered by the sight of glaciers and snow-capped mountains. 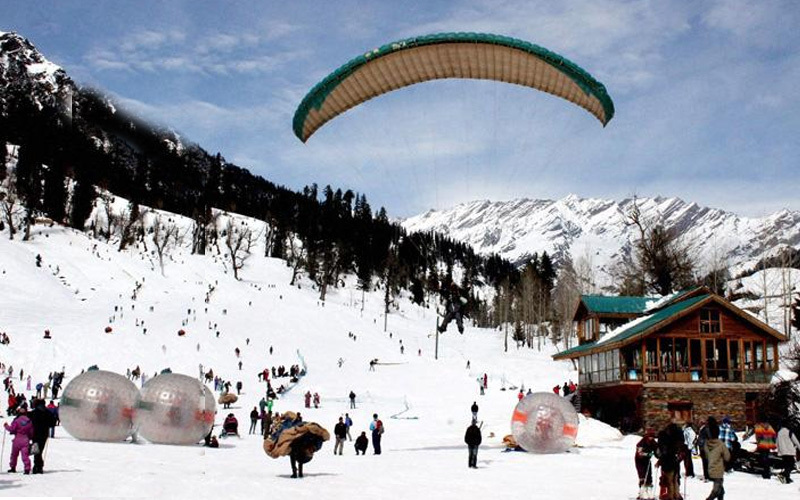 Located between Solang village and Beas Kund, this is a destination to also gladden every thrill-seeker’s heart. Skiing in winter offers the excitement of slipping and sliding over pristine snow. When you camp here withKesari Tours in the summer months, the options increase as you get a taste of horse-riding, parachuting, paragliding and the hot new sensation – zorbing. 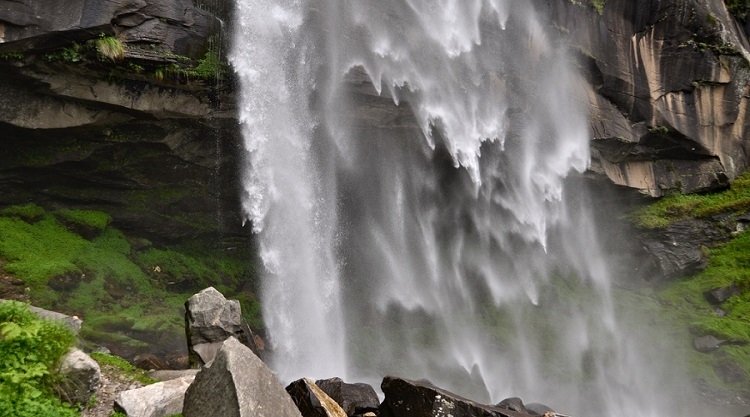 Satiate your yearning for exploring at the stunning, scenic Rohtang Snow Point. Located at a height of 3979 meters and at a distance of 51 km from Manali, the famed Rohtang Pass is on the highway to Keylong/ Leh. Snow-bound in winter, summer sees Rohtang wear her prettiest lush green colors. It’s also the best time for adventure enthusiasts who have ample opportunity to seek adrenaline highs! Reconnecting with the natural world awakens your senses and immerses you into the beauty of nature. A stopover at the pristine Rahala Falls is just what a city soul needs to wash away the mental grime. Splashing in its refreshing waters which flow down from an altitude of 2,500 meters, nature’s shower invigorates like no other! Each new dawn and every night spent under the stars awaken the spirit to the natural masterpieces that surround us. 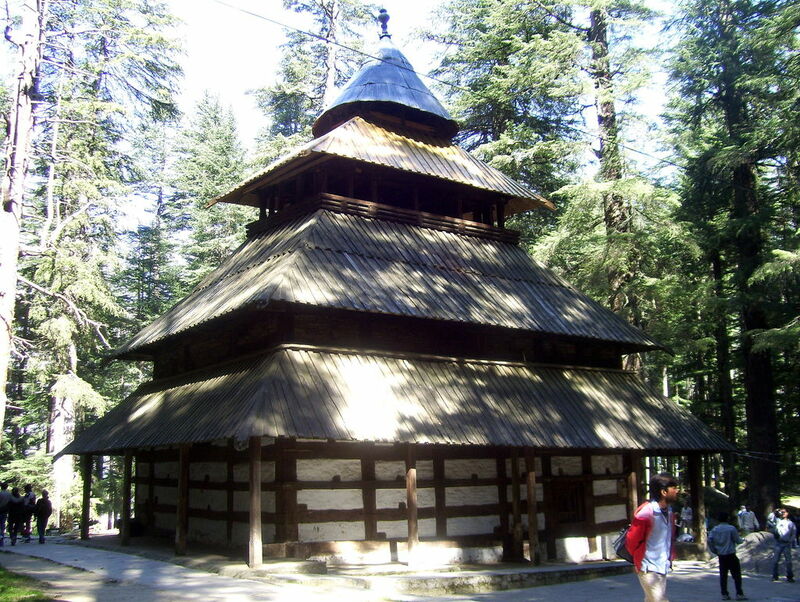 The Hidimba Devi temple, set amidst a sacred cedar forest at the foot of the Himalayas, manifests the desire to send up praise and thanks. With Kesari Tours you discover this holy site, built over a huge rock jutting out of the ground and worshiped as a manifestation of the Goddess of the Earth. The sky is your roof, the mountains, your walls. It’s time to step out and live!